Much of the info on this site was extracted from John Muir Trail: The essential guide to hiking America's most famous trail by Elizabeth Wenk with Kathy Morey. Please purchase the book for some of the best detailed information available about the JMT. The remainder of the text was written by Steve Singkofer with information gleaned from various sources. Because Tom Harrison's maps use NAD27 data for some reason, all GPS waypoints are given using that data. The Wenk/Morey book also uses NAD27 data. If you're interested, you can download a zipped .GPX file with all of the 358 GPS waypoints from the book. John Muir Trail NAD 27 GPX File (zip) with points culled from the above reference, and for use with Tom Harrison's JMT Map Set. One month on the trail plus three to five nights in hotels. After our afternoon and evening at Tuolumne Meadows, the trail descends slightly into Lyell Canyon, which it follows south. We'll have mostly level walking for several miles until we begin to reach the southern end of the canyon. There are several good campsites along the way, but we will try to continue as the trail begins to climb toward Donohue Pass. Shortly after passing the 10,000 foot level, we'll come upon a small lake which is the headwaters of the Lyell Fork of the Tuolumne River. That will be our campsite for the evening. Map 12 / 10.9 / 1,500' We'll leave Donohue Pass for the next morning's hike. At 11,050' high, Donohue Pass is our first real High Sierra pass. 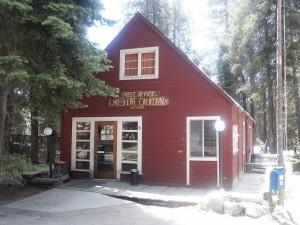 This is also the point at which we will leave Yosemite National Park and hike into the Ansel Adams Wilderness in the Inyo National Forest. The largest glacier in the Sierras lies on the face of Mt Lyell, and we should have great views of the glacier as we climb toward the pass. In the morning, we'll hike out of the Inyo National Forest and cross into Devil's Postpile. 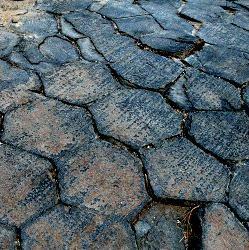 A small national monument, Devil's Postpile features the unusual formation of hundreds of posts of basalt that had the opportunity to solidify without mixing, allowing them to freeze in hexagonal posts. A mile from Devil's Postpile lies Red's Meadow which has a campground, a hot springs plumbed into shower stalls providing free hot showers, a store (food but few supplies for hikers - it appears to serve fishermen more) and cafe, both open 7 AM to 7 PM, and a shuttle bus that goes to the town of Mammoth Lakes (round-trip: $9.00). The next morning we'll hike up and over Silver Pass on Silver Divide. After a break, the trail descends past Silver Pass Lake, follows Silver Pass Creek to the North Fork of Mono Creek at Pocket Meadow then descends to Quail Meadows, a mile east of Lake Edison. 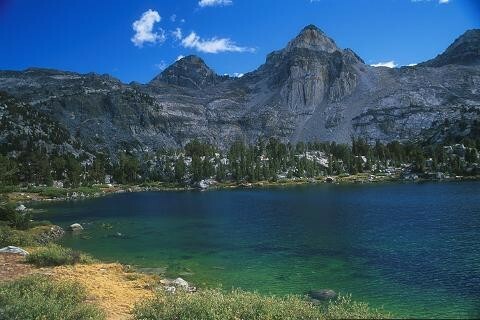 We depart the JMT here for another resupply stop and a one-day layover at Vermillion Valley Resort (VVR). Map 8 / 8.2 / 600' They are attempting to cater to the John Muir Trail hiker and may offer a free night in a tent cabin with a soft bed! The first beverage is on the house, too! The next morning the trail crosses Senger Creek and descends an exposed ridge to the South Fork of the San Joaquin River. About halfway down a trail that leads directly to Blayney Meadows and the Muir Trail Ranch with its hot spring meets the JMT. 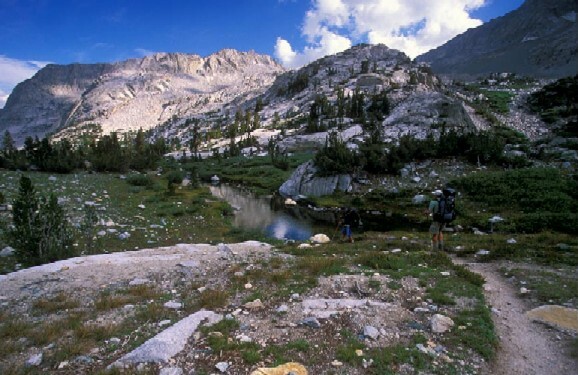 The JMT itself descends a little less steeply than that trail to the bank of the South Fork to where the Piute Creek joins the South Fork and the border with Kings Canyon National Park. Early the next morning, the trail crosses the San Joaquin on bridges twice until it reaches Goddard Canyon, where it heads east steeply up into meadow-filled Evolution Valley. After passing Evolution Meadow, McClure Meadow and Ranger Station, and Colby Meadows it climbs to Evolution Lake, Map 6 / 10.6 / 2,500' surrounded by many high mountains named after famous scientists who contributed to the theory of evolution. These mountains are very popular with climbers. We may be able to spot Darwin Glacier on the north slope of Mount Darwin. Once again, within a few miles of leaving camp, we have another pass to cross. This time it's Pinchot Pass. The climb to this pass is much easier because of the grade and because of our acclimation. From here the trail leaves water and vegetation behind. Now it climbs and switchbacks steeply toward Trail Crest, the pass on the ridge which separates Sequoia National Park from Inyo National Forest. Just before the JMT reaches Trail Crest, the trail to Mount Whitney splits off to the north. Drop your packs here (don't leave any food for the marmots), take your daypack and head for the summit. Mount Whitney, 14,505 feet tall, is the highest mountain in the continental United States. The two-mile-long trail climbs steadily past four "windows" before making a final turn to the east and the summit. Rest here for an hour before heading back down to the packs.